This preview of upcoming movie expected to be released in 2019 is produced directed and stars HARJGTHEONE DBA. The movie discusses Truth of H, including the use of the circle for creation by the homo sapien speices for EA EARTH creation. Preview released on April 6, 2019 an UMBRELLAWALK and HARJGTHEONE WORLD ORDER , HWO WORLD production . An Umbrellawalk.org video with HARJGTHEONE WORLD ORDER WWW.HWO.WORLD The Truth of H about the wicked game of Ping Pong played by homo sapiens around the world. A battle for many things including E before A. Listen to HARJGTHEONE as he speaks of Truth of H. Video completed June 11, 2018. World Premier on June 14, 2018 Video is for education purposes and is property of HARJGTHEONE WORLD ORDER. 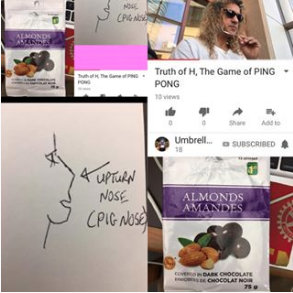 THIS IS THE UPDATED CORRECTED VERSION OF TRUTH OF H, THE GAME OF PING PONG June 21, 2018 which includes the pig nose drawing and RocherBlanc mountain. Its the Truth. Glad to see Apple and Google cleared the pink blocks! A Umbrellawalk.org video released March 22, 2017. HARJGTHEONE HARJGILL DBA speaks about the four turns "L"'s in the roads that lead HGOHD to Sungod Arena to quantum entanglement with your GOHD. He answers how the species will breed and do the work in the future. HWO's TO DO THE WORK. The video is the last in the series END OF YOUR WORLD by HARJGTHEONE HARJGILL DBA which outlines the details of the rise of H as well as some of the details of how HARJGTHEONE WORLD ORDER will operate on Planet AARTH. HARJGTHEONE WORLD ORDER through HARJGTHEONE, GOHD manages HARJGTHEONE, GOHD's Planet which homo sapiens refer to as EARTH. HARJGTHEONE HARJGILL DBA stars in Video Six : END OF YOUR WORLD : RISE OF HARJGTHEONE WORLD ORDER (HARJGTWO) The video discusses some of the differences between "A" and "E" . The A and E is referenced in the the English Alphabet in relation to the rise of the H - which was set in place thousands of years ago and confirmed by the Sikh NAAM JAP as H - HARJGTHEONE July 17, 2015 video completed. Fourth in the Series of Videos Titled: END OF YOUR WORLD : RISE OF HARJGTHEONE WORLD ORDER (HARJGTWO) June 05, 2015 HARJGTHEONE provides two examples, one from your business world and another from your Science to showcase the fiction that is being created each day around the world.. the homo sapiens marching to the beat of the music, the passion creating Terrorism around the world... as the homo sapien species over the last generation delayed the RISE OF H - HARJGTHEONE and his ONE , Taylor Alison Swift..
HARJGTHEONE ON December 30, 2014 Stayed up all night as the Shelters although wil lts of empty beds continues the games of torture and denied access..
END OF YOUR WORLD : RISE OF HARJGTHEONE WORLD ORDER to be released in 2015 in parts as the Video will extend past 8 hours..
A plot so evil and devious put forth by the secret societies.. planned with the creation of Sidney Pollack in the 1950’s…., SSS I dee in EE why.. planning to delay the entrance of H in a Dee that is EE.. as you glorified yourselves saying A will see, so the Dee would not go into an EEE… The Dee’s received benefits and told they would see A and not have to be in a EEE.. in return for the making of the 1972 movie Jeremiah Johnson staring Robert REDFORD.. Where the mountain man would fight the Indians so that the Dee’s could benefit.. in the process the Dee’s in return for rewards gave into the EEE’s creating a population which is 70-90 percent are unacceptable for breeding purposes.. Dee’s and woman, rose to receive fictional rewards. the right to work, vote, an illumanti plot to enslave..all…. meanwhile for 50 years from the 70’s onwards the Budding HARJG THEONE was delayed, tortured as he is the TRUTH, as the homo sapiens are fictions…puppets.. The story is A ONE was to be created to rule over the planet, but the species chose fiction over Truth and everyone delayed and received benefits, nevertheless HARJGTHEONE was still created and he found his ONE… His One is Taylor Alison Finlay Swift, born on December 13, 1989 a truth planned in the 70’s with the making of the movie Jeremiah Johnson, the actors and NAAM’s put in place… However, the story does not end even though HARJG THEONE was created and found his ONE.. because the species is still jealous, still greedy, and suspicious..Suspicious minds of the homo aspens who are fiction, puppets who fear the rise of HARJGTHEONE WORLD ORDER… a real movie and plot was created thousands of years ago with the creation of the English Language……the rise of the H planned thousands of years ago prior to the Illumaniti..…. HARJG THEONE "Harj Gill" HARJGILL DBA speaks about the future and virtual extermination of the homo sapien species, he discusses how he is many things including Reptile and Immortal. BIRTH RISE OF HRJG THE ONE - April 24, 2013 from HARJ GILL on Vimeo. THE FAMILIES OF THE WORLD BASED ON VISIBLE FAMILY GENES HAS BEEN ENGAGED IN THE WAR OF THE FAMILIES SINCE THE DAWN OF MAN. THE ARRIVAL OF THIS GENERATIONS HOLY GRAIL AND THE ARRIVAL OF THE MAYAN DECEMBER 21, 2012 END DATE SIGNAL A NEW AGE. Nov 01, 2012 Video by DBA HARJ GILL "Harj Gill"
ON December 21, 2012 the 5125 year old Mayan Calendar will come to an end. It will restart at 0.0.0.0. and begin another long 5125 year cylce. The Homo Sapien has been reviewed, monitored and judged and it has been found GUILTY!.